Talkin’ Nerdy: Hot for Betty | TWINSANITY! 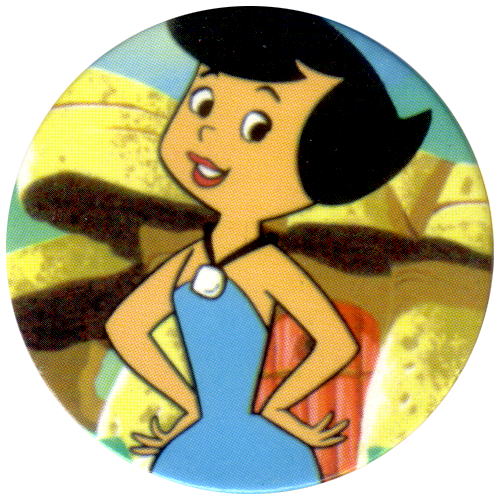 Let’s talk for a bit about The Flintstones character Betty Rubble, shall we? Cartoon Network once aired a special marathon in the guise of a fake award show in which the categories would be specifically tailored so that only one cartoon character or short could possibly be the winner, thus leading to an airing of said short (see also NBC’s Saturday morning preview special The NBC Yummy Awards). The “show” was titled The Golden Betty Awards, represented by a golden statuette of a miniature Betty Rubble. CN of this period aired not one, but two promos implying a tryst between Betty and Race Bannon from Jonny Quest, in one of which Betty is nearly caught chatting it up with Race over the phone by Barney, but she quickly covers it up. My mother wasn’t fond of these. Now, these repeated ‘Betty-isms’, we’ll call them, could just be seen as harmless loony non-sequiturs, but they could also give one pause as to what exactly was going on at Cartoon Network Studios during those days. There must have been some pretty interesting water cooler conversations going on there….. 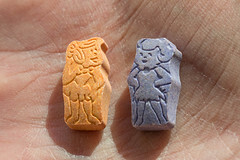 Anyway, apparently CN execs weren’t the only ones hot for Betty, as around this same period of time a long drought was finally brought to an end: namely, Betty Rubble’s 30 year absence from Flintstones’ Vitamin jars. Fun Trivia Fact: the vitamins were first introduced in 1960 by Miles Laboratories as “Chocks”, the first chewable multivitamin marketed directly for children, and their stop-motion commercials offered a series of fun, though unfamiliar, characters. That all changed in 1968, when Miles swapped the Chocks characters for the cast of The Flintstones. Nearly all the characters were available to be chewed up and swallowed – Fred, Wilma, Barney, Pebbles, Bamm-Bamm, Dino…even that weird green space alien, the Great Gazoo at one time. There was one glaring omission, however – Barney’s wife, Betty! There were (at least) two possible reasons why Betty didn’t have her own vitamin: First, manufacturers claimed that Betty’s waist was too thin and kept breaking during production. Second, Betty was virtually indistinguishable from Wilma. 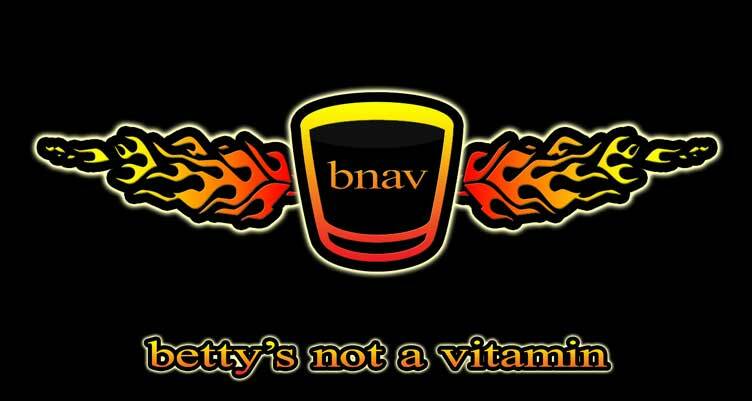 Though there was a small Betty for vitamin movement, including an Atlanta rock band that called itself Betty’s Not a Vitamin…. Another Fun Trivia fact: Betty’s Not a Vitamin was named one of the 100 best band names by Paste magazine. ..they may as well have just banged their collective heads against the wall (or banged each other about the heads with clubs, if they wanted to be authentic about it). It wasn’t until actress and comedienne Rosie O’Donnell, who played Betty in the 1994 live action Flintstones film, brought Betty’s plight to the attention of the nation that anything was really done about it. O’Donnell, during a television interview about the film, complained that all the other characters were represented, but not Betty. A savvy marketing agency seized the opportunity to involve the consumer in the direction of the brand and launched a nationwide campaign to determine Betty’s fate. The agency set up prehistoric style voting booths in regional shopping malls across the country, as well as a 1-800 number, to allow consumers to decide whether Betty should be let in the club. The public didn’t let her down. More than 3,000 kids and their mothers voted in person and more than 17,000 calls were logged, with 91 percent in favor of bringing in Betty. She finally became a vitamin character in December 1995, replacing the Flintstones’ car. Thus rendering the band Betty’s Not a Vitamin’s name outdated (but if they’re still performing, they can always just swap the ‘t’ in ‘Not’ for a ‘w’ and rename themselves Betty’s Now a Vitamin) and if those Bettyphiles at CN are still around, they can now nibble on a Betty vitamin to satiate their cravings…assuming they don’t just bite down on a rubber hockey puck when it’s time for that high voltage fun.